Choose your frame's color. We have accessories to match our frame styles, and when in doubt, black goes with just about everything. Can lift up to 530 lbs. 4-leg frames with the Advanced Digital Memory Keypad do not have one-touch functionality with regards to heights saved in memory. Press and hold the memory preset until the desk arrives at the saved height and stops. Weight capacity for UPLIFT frames assumes that weight is evenly distributed across the desktop. Improper weight distribution may damage the actuators, create a tipping hazard and void the warranty. Please observe all instructions and notices in the provided user guide. Standard configuration assembly with crossbar rails is highly recommended for all desktops and required for all desktops less than 1" thick. Alternate configuration assembly allows for custom placement of the legs on your desktop using the Zero crossbar brackets. Make sure the desktop you put on this frame is at least 1" thick and is stiff and not prone to bending, sagging or cracking. For desks larger than 72" long, desktops should be at least 1.5" thick. Never open electrical components such as the control boxes, actuators, or keypad. Do not let children play on or around the desk. When I try to use the one-touch functionality on my Advanced keypad, it doesn't work. How can I tell which control box I have? You quickly can check to see which version of control box you have by glancing at the silver label on it. If it says v4.1, v4.2, or v4.3, you know you have the newest version of our control box, complete with several new features! My control box says "V4.1". Do I have new features? Yes, the latest version of our control boxes comes with a new safety feature - Collision Sensitivity. This allows you to set the sensitivity for your desk to one of three levels, so when adjusting your desk stops when it touches an object, instead of continuing to raise or lower. Keypad Lockout is another new function you'll love. When this feature is turned on, your desk is safer for children thanks to having the ability to lock the keypad from making unwanted adjustments. Toggle between One-Touch and Constant-Touch modes with just a few buttons. You'll also be able to switch between inches and centimeters on your keypad with just a few buttons. We think you'll agree, this is a smart, safe, reliable desk that you control. Which type of frame does this come with? Our updated black, white, and gray 4-leg frames, which were released in early 2018, have a new design and come with stabilizing crossbars. If you have any questions about your desk or how to upgrade your 4-leg workstation, give our Support Team a call and we'd be happy to help you. Why doesn't the frame work if I remove one of the legs? Each control box is specific to the number of legs on the frame (2, 3, or 4). Therefore, if you remove one of the legs the entire frame will not work. Is this compatible with a large, laminate desktop? Can I build my old frame to be like the new frame? Yes, contact us if you have an older model and wish to convert it to the newer frame. We will help you figure out the additional pieces that you need. What is the benefit of a 4-leg frame over a 2-leg frame? The 4-Leg Frame is handy if you want to install a large or unusually-shaped desktop. It also has a larger carrying capacity, which comes in handy if you are using your desk to carry something substantial, like a large quilting machine or a turn table. What's so special about having a motor in each leg? All UPLIFT Desks boast a motor in each leg, so you can rest assured your desk is the safest, quietest, strongest, and most reliable desk you can buy. 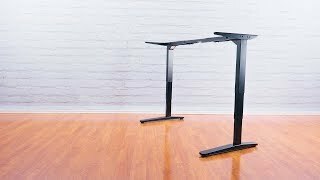 Most electric sit-stand desks on the market only have a single motor. Are there any restrictions to the kinds of tops that I can attach to this? Yes, for stability we do not recommend installing a top larger than 36" D x 80" W. This 4-leg frame is compatible with our 60" x 30", 72" x 30", and 80" x 30" desktops. Why would I get a 2-leg when the 4-leg is better? A 2-leg frame is more economical. Although it does not have the carrying capacity of the 4-leg frame, many people do not need a desk that will hold 530 pounds if they are just using it as an office desk. Is the 4-leg frame as quiet as the 2-leg frame? Why are three-stage frames better than two-stage frames? That has to do with the 3 spindles we have in each of our frame legs versus the standard 2 you find on cheaper height adjustable frames on the market. Because we have an extra spindle, it makes our desks 33% quicker to adjust! Also, our three-stage frames offer users a higher range of height adjustability, so they suit a wider group of users, from petite people to the very tall - even kids! If you plan on adding a treadmill to your standing workstation down the line, a three-stage frame is important to give you the extra height you need to raise it high enough to use the machine. Can I use glass as my desktop? No, we do not recommend using a glass top. Will two people be able to move the 4-leg frame? The 4-leg frame is quite substantial and this really depends on how heavy your desktop is. More than two people might be necessary to move a large conference table. Can I use the 4-frame frame with a circular top? Certainly! The 4-leg frame is useful for different shaped tops, like a circle. Just make sure to even distribute the weight of the top among all four legs and that you are using a substantially solid desktop.